Literally translated as a “warm spice mixture,” this Northern Indian fragrant blend creates a warm impression on both the palate and the spirit. This wonderful blend of dry-roasted and grounded, hand-mixed spices is considered to be one of the more traditional mixes in Indian cuisine. 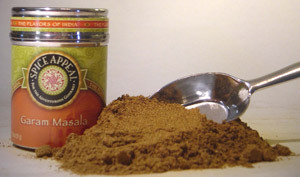 Creates a sweetened and finished taste to curries and soups. Add to curries and spicy dishes, at the end of cooking, so as to prevent from ruining the aromatic oils. Goes well with fish, onions, cauliflower, and potatoes. Delicious when sprinkled on grilled lamb, pork, and poultry, and other meats towards the end of cooking. Stir in 1 tsp to cooked rice for a delicate spicy taste. Contains a variety of ingredients including cardamom, Tellicherry black peppercorns, cumin, cinnamon, cloves, coriander, and other spices.